Salon Music probably means different things to different people. To some it may mean the Trio of ladies of a certain age playing at the local Thé Dansant, to some it would mean the sort of thing one would expect to have heard on a Continental holiday years ago. One thing is certain - in this country at least - it would not be a complimentary description. It has been applied in a dismissive and patronising way to composers who have strayed from the straight and narrow in the eyes of a blinkered listener - Elgar's Salut d'amour comes to mind. To most, I would imagine, it would mean tuneful pieces, sentimental and probably syrupy and certainly old-fashioned. 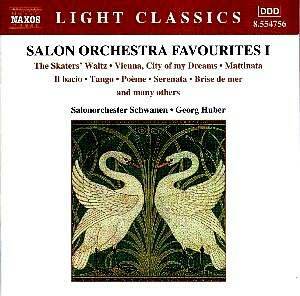 This Naxos CD uses the term to include music either written for the concert hall or the opera house which is then adapted for whatever instrumental forces are available for performance and, of course, it must include pieces specifically with the salon in mind. Its peak in popularity was the late 18th and early 19th Centuries when recorded music was still largely a dream and there was a growing, increasingly affluent society wishing to hear more from the mass of music already available elsewhere. This disc is from Germany, the recording, the orchestra and the notes are an English translation from German. The selection of items, then is from a Central European viewpoint and a British selection from the same period would probably be rather different - Albert Ketelby, for instance, would doubtless appear somewhere. The music chosen is a mixture of the familiar and the unknown. Arditi's Il bacio, Albeniz Tango, that old war horse Serenata by Toselli, Leoncavallo's Matinata, Vienna City of my Dreams, an extended Skaters Waltz - these and others would strike a instant chord. The excellent playing, sounding fresh and alert throughout, attempts to catch the period atmosphere and succeeding with the arrangements used sounding authentic. Lots of rubato and exaggeration, gipsy fiddling, accordion interludes - they are all there. The recording - clear but a touch ' toppy'. An enjoyable record with a limited appeal, no doubt, but as this is Volume I if you like it there is obviously more to follow.